Humboldt State University's Trumpet Consort von Humboldt just returned from a unique performance with baroque natural trumpets that were common in 17th century England. HSU musicians, L to R: Charlie McClung, Kevin Blake, Chris Cox, Nick Camacho, Gil Cline, Andrew Henderson, and Ryan Blake. 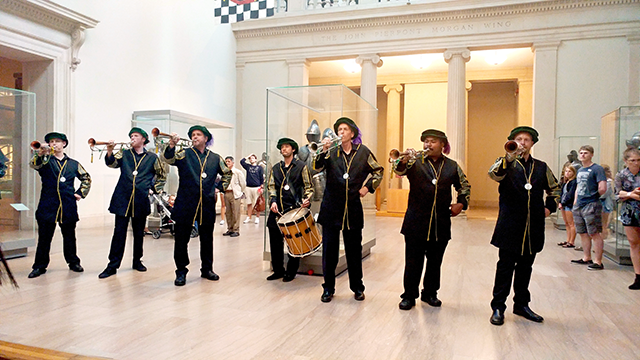 HSU’s Trumpet Consort von Humboldt recently played at the New York Metropolitan Museum as part of the Historic Brass Society’s 2017 symposium.